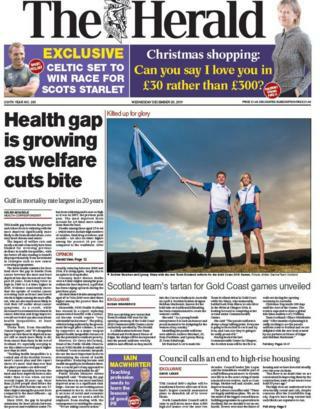 The health gap between the poorest and richest Scots is widening, with the most deprived significantly more likely to die from alcohol abuse, coronary heart disease and cancer, writes The Herald. 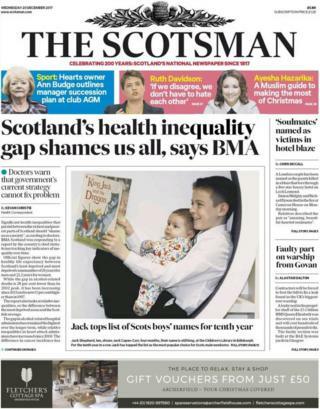 The Scotsman also leads with the story and reports that official figures show the gap in life expectancy between Scotland's least deprived and most deprived communities is 26 years for men and 22.2 years for women. 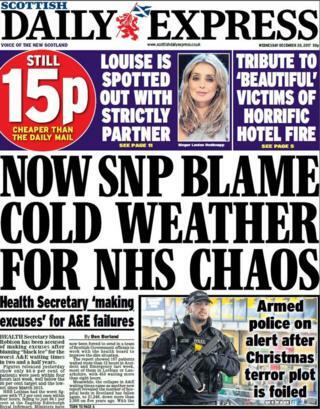 Meanwhile, Health Secretary Shona Robison has been accused of making excuses after blaming "black ice" for the worst A&E waiting times in two and a half years, according to the Scottish Daily Express. 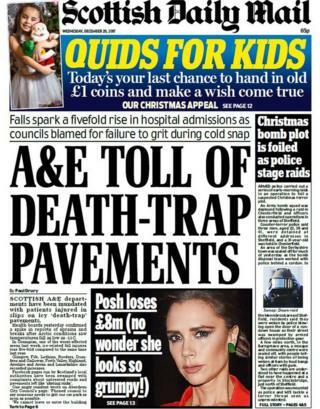 The Scottish Daily Mail also devotes its front page to the story and says Scotland's A&E departments have been inundated with patients injured in slips on icy "death trap" pavements. 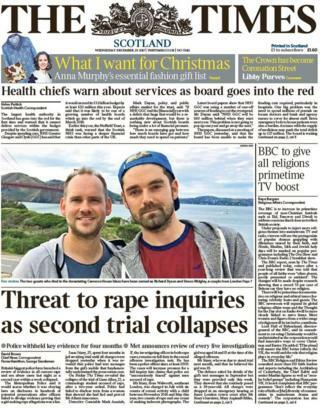 Staying with health, The Times Scotland reports that NHS Greater Glasgow and Clyde has gone into the red for the first time and warned that it cannot deliver services within the budget provided by the Scottish government. 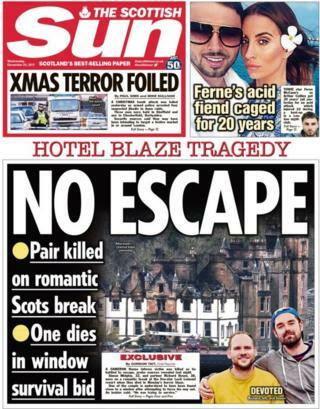 In other news, The Scottish Sun continues its coverage of the tragic fire at Cameron House on the banks of Loch Lomond. 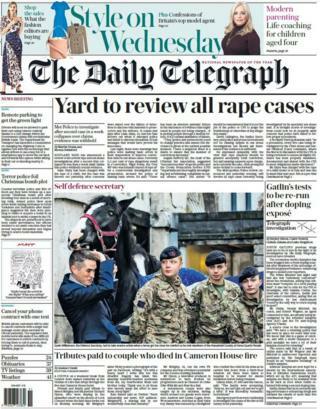 The paper claims that one of the men who died in the blaze was understood to have been found close to a window after attempting to force his way out of the hotel. The Daily Record also focuses on the fire and says victim Simon Midgley shared his excitement about his "home for the weekend" on social media just hours before he was killed in the deadly inferno. 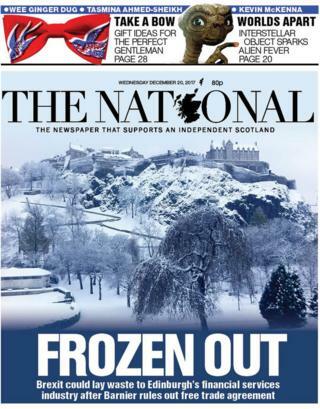 Scotland's financial industry is set to be hit far harder than London by Brexit after European chiefs ruled out giving firms a special arrangement to trade freely in the EU once the UK has left the bloc, according to The National. Athlete Justin Gatlin's previous drugs tests are to be re-run in the light of a Daily Telegraph investigation, sources have told the paper. The 100-metre world champion has been dragged into a fresh doping scandal after claims that members of his entourage offered to supply performance enhancing drugs to undercover reporters. 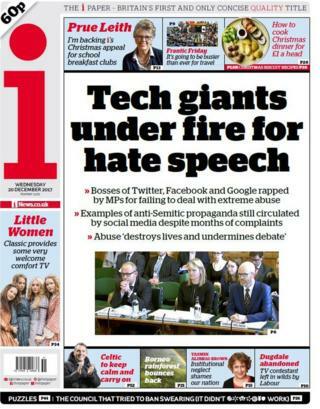 Social media giants have been reprimanded by MPs for their failure to remove abusive hate speech, including anti-Semitic tweets aimed at MPs, as MP Yvette Cooper urged them to do more on the issue, writes the i newspaper. 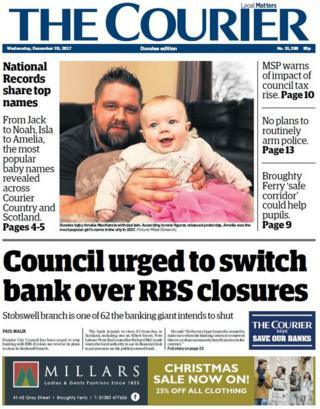 Dundee City Council has been urged to stop banking with Royal Bank of Scotland if the banks fails to reverse its plans to close its Stobswell branch, reports The Courier.